A new video of Kartik Aaryan, charming the socks off his fans as usual, has been shared online. 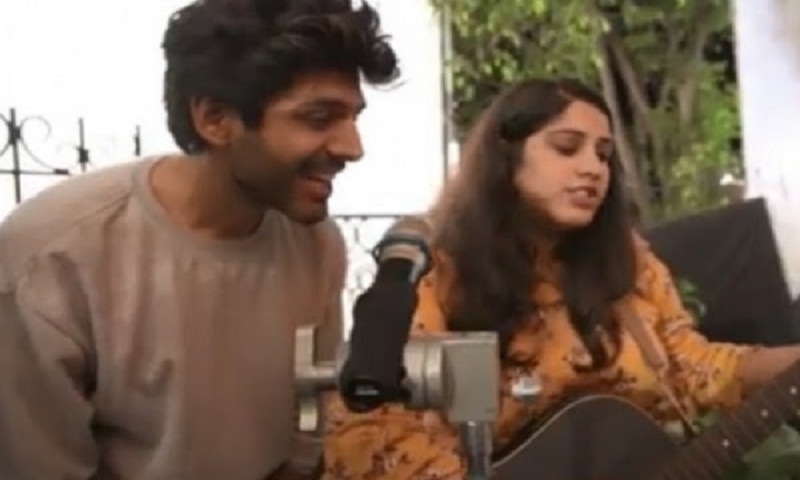 The video shows the actor singing a song from his popular film Sonu Ki Titu Ki Sweety, much to the pleasure of his devoted fanbase. The video was posted on the official Instagram page of Window Seat Films, director Imtiaz Ali’s production company. Imtiaz will direct Kartika and Sara Ali Khan in a new film, said to be a sequel to his Love Aaj Kal. Work on the film commenced with a party recently, pictures and videos from which have been shared by Kartik and Sara on their social media accounts. A poster for the film, which shows Sara resting her head on Kartik’s shoulders, has also been revealed. The two actors were introduced to fans outside the office of Imtiaz’s company. Videos of them waving to a large crowd from a balcony have also been shared online. On Monday, a video from the same party, which showed Sara embarrassing Kartik by yelling his name in public, was shared by the Kedarnath actor, report Hindustan Times.